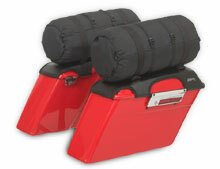 Another luggage option for your Bagger! LidHaulers, LidCovers & LidSaks: LidHaulers are designed to double your saddlebag capacity in a portable cost effective way. 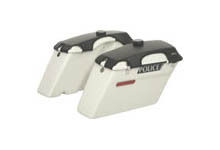 LidCovers offer the benefits of protecting the saddlebag lids when carrying extra gear is not a requirement. 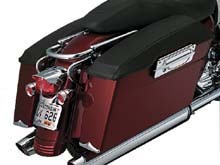 Owners of Harley-Davidson® FL Touring Models (LH-1 1993 to 2013 or LH-1R for 2014+), with original painted hard saddlebags that need to haul more gear, but don't want the expense, bulk, and weight of luggage racks and tour paks now have a revolutionary option. Saddle Bag Cargo Hauler products are completely portable and increases a bikes carrying capacity without compromise. Easy attachment to a bike's inner saddlebag lid with adhesive backed Velcro. Optional LidSaks are designed specifically for use with Lid Hauler carriers. You can strap almost anything to these! Special order items. Patented one piece construction and scalloped sides for a superior fit and soft padding underside that will not damage painted surfaces of the lids. Police bike models for 1993 to 2013. 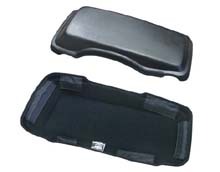 Lid Shields: Saddlebag lids can really take a beating. How many times have you or your passenger dragged your boot heel across them as you’ve swung a leg over the seat? Slip on a pair of Saddlebag Lid Shilds & these little mishaps won’t be a big deal anymore. Soft, matte-finished black vinyl with a felt-like lining helps prevent scuffs, nicks & abrasions. They look great too! 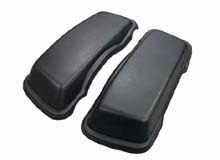 Premium Saddlebag Caps: Thermoformed to fit perfectly over H-D hard saddle bag lids (1993 - 2013). No stretching and pulling to get them to fit right. No rolled up corners like thin covers - no wrinkles in hot weather. Just drop them in place - they are contoured to fit the lid perfectly. 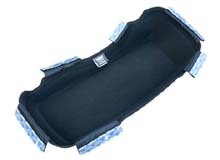 Dent-recovery foam between rich synthetic leather and felt bottoms protect your paint. Only soft felt undersides touch your paint/ Installs in minutes - adhesive Velcro strips attach to underside of lid. Stylish paint scratch and chip protection for your saddle bag lids. 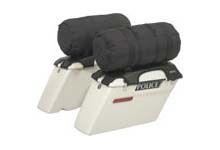 LS-1P: Similar to above but for model year 2014+ saddlebags.